SEO Northern Beaches. Rank top of Google. Local SEO expert. No contracts or on-going fees. Just search engine marketing tailored to your requirements. Do you find yourself asking the following questions regarding your Google ranking (or lack thereof)? I’ve just got a new website designed but I can’t find it on Google? I paid someone a lot of money to optimise my website but I’m on page 4 of Google. No-one will bother to look there! Less experienced businesses than mine are ranking higher on Google and stealing my customers. Why is my competitors website ranking higher than mine? Other websites are uglier than mine but are ranking on page 1 of Google but mine is nowhere to be found. Don’t worry, I’m here to help and have been ensuring my clients get a top Google ranking (and stay there) for over 15 years. If your business isn’t ranking on page 1 of Google and other search engines it is near impossible to compete in the crowded online marketplace. The image below represents the percentage of clicks the top 3 rankings on Google receive. The further down the list your website appears, the lower your click through rate. And let’s not even contemplate how low your click-through rate if you appear on page 2 or lower. 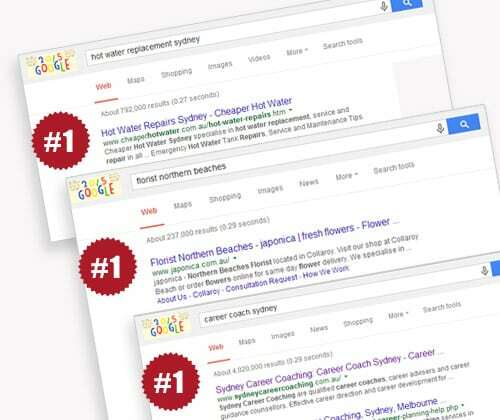 Contact local Northern Beaches SEO expert, Rebecca Mitchell, direct to discuss your specific requirements. Rebecca will ascertain the most cost effective, results-driven option for you and your business. Call 9982 5057 or complete our online enquiry form. Do you want to start managing the SEO and online marketing of your website in-house? Or, are you already doing so but not getting the results you anticipated? My digital marketing and SEO consultancy services are the perfect solution. If your business relies on a top search engine ranking then attending one of my workshops or organising a tailored digital marketing consultancy session could be the best marketing decision you make all year. Gain the confidence and skills required to confidently manage your online marketing campaigns in-house. Unfortunately there is no silver bullet to getting found online in the modern marketplace. It’s a never ending process that requires ongoing commitment, a continuing evolution of keywords, online activity, linking to others, social media activity and other ways to evidence traffic and engagement on your website. A culmination of these factors ensures you gain the attention of Google so your business can be found by your potential customers. My consultancy sessions and training courses provide you with step by step guidelines to equip you with everything you need to know to ensure you secure and maintain a top organic ranking on Google. You will gain the skills to manage your online marketing with confidence.